Chinese company Anbang has withdrawn its bid for Starwood Hotels and Resorts, leaving Marriott International the remaining bidder. The Chinese company Anbang has withdrawn its bid for Starwood Hotels and Resorts, leaving Marriott International the sole remaining bidder for the hotel chain. 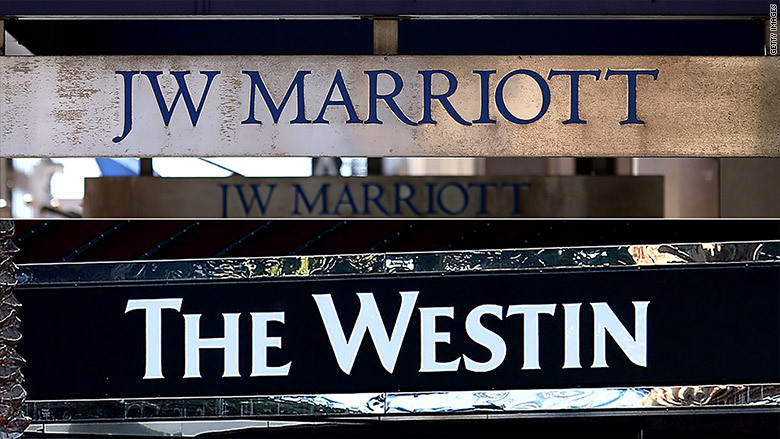 A deal between Marriott and Starwood would create the the world's largest hotel company. After Marriott made its first bid to buy Starwood for $12 billion in November, Chinese insurer Anbang swooped in with a sweeter offer. But Anbang is pulling out of negotiations just days after offering $14 billion. "We were attracted to the opportunity presented by Starwood because of its high-quality, leading global hotel brands, which met many of our acquisition criteria, including the ability to generate consistent, long-term returns over time," Anbang said in a statement, but the company won't pursue Starwood further due to "various market conditions." With Anbang out of the picture, Starwood intends to go with Marriott's latest offer of a $13.3 billion buyout. "We are excited to be part of the world's largest hotel company with an unparalleled platform for global growth," said Starwood CEO Thomas Mangas. Starwood owns the Sheraton, Westin and W hotel chains, and Marriott's brands include Courtyard and Ritz-Carlton. Investors were disappointed by the apparent end of the bidding war for Starwood. Starwood (HOT) and Marriott (MAR) shares each shed more than 4% after the news broke Thursday evening. Correction: An earlier version of this story had the incorrect value for Marriott's latest bid for Starwood.